By the time the Yankees signed Mariano Duncan as a free agent in December of 1995, the Dominican middle infielder was already a 32-year-old, 11-year veteran of the big leagues. The Yankees expected to play their rookie, Derek Jeter at short in 1996 and were going to move switch-hitting Tony Fernandez from short to second. They wanted Duncan to serve as a backup for both positions. That plan fell apart when Fernandez got hurt in spring training and was shelved for the year. Manager Joe Torre gave Yankee rookie Andy Fox every chance to win the second base job but the youngster could not get his average up to .200. Then Torre gave Duncan a try. He responded with the best season of his career. Mariano hit .340 in 109 games that year. He became a leader in that Yankee clubhouse and his popular pre-game pronouncement, “We play today, we win today…dassit” became the slogan of that amazing club. When the Yankees won the 1996 Pennant and World Series, I was pretty certain Duncan would be back to start at second again in 1997. But George Steinbrenner did not feel the same way. He did not think Duncan was good enough defensively and when the Boss’s feeling became public, Mariano was angry and demanded to be traded. The Yankees tried to grant him that wish by reaching a deal with the Padres that would send Duncan and pitcher Kenny Rogers to San Diego in return for slugger Greg Vaughn. When Vaughn failed his physical and the deal was voided, Duncan became even more vocal about his dislike for Steinbrenner. Finally, after the All Star break, the Yankees traded Duncan to Toronto. He played his final 39 big league games as a Blue Jay and then tried Japanese baseball for a year before retiring for good. 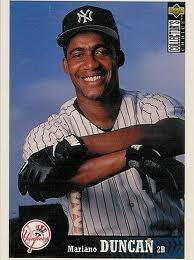 Yankee fans will always remember Mariano’s great year in 1996 and he has a ring on his finger to prove it. This former Yankee slugger shares a March 13 birthday with Mariano as does this former outfielder who was the last Yankee to wear uniform number 7 before Mickey Mantle made it famous.